If you have a notebook computer connected to multiple displays at home or work then disconnect that display, you can sometimes end up with windows that when restored show on the now non-existent 2nd display. 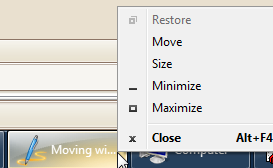 To move that window back to the primary on Windows XP you’d right-click the icon in the task bar, and choose the Move option, you’d then press one of the arrow keys on your keyboard, which would start the window moving, and then you could use your mouse to move the window quickly to the active screen. Doing so displays the window menu. Worked very well. My Bitcoin-GUI-Window was on the wrong screen. thanks, these instructions are perfect and easy to follow. This is the best and simplest solution so far, thanks! Windows 7 method works on windows 10!